March has to be my favourite month. With the heralding in of Autumn – my favourite season – and it’s trademark sunny days and cool nights here in Melbourne, it really is the most beautiful time of the year. It’s also a time when we can begin to flirt with the idea of Winter fashion-wise while still making the most of our Summer wardrobes. I find that the simple addition of a Autumnal pop of colour, a scarf or an easy outer layer can take my warm weather wardrobe well into the cooler months. 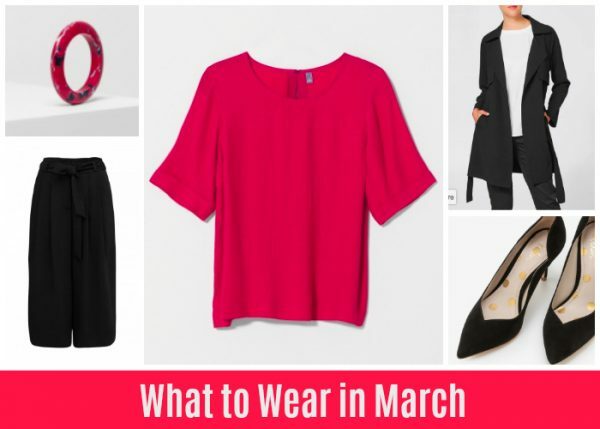 With that in mind, I’ve put together three hard working outfits for the coming months – up to date takes on work, smart casual and everyday looks. All features layers which are so important at this time of year, as well as statement jewellery and easy wearing pieces that move easily between the smart casual and dressy ends of our wardrobes and feel as good as they look. This first outfit is a modern take on corporate dressing. ABOVE, CLOCKWISE FROM TOP LEFT: Marbled Resin Bangle, $47 from ELK; Ripple Box Top, $125 from ELK; Soft Trench Coat, $49 form Target; Madison Court Shoes, $180 from Boden; Tash Soft Culottes, $89.99. There’s so much I like about this outfit. To begin with, the beautiful raspberry top from Elk is SO flattering and can be worn out or tucked in to pants or a skirt. I’ve opted for a soft, paper bag style culotte here, which creates definition and shape around the waist and is a change from the classic tailored pants or pencil skirt corporate approach. If you’re not as keen to emphasise your waist, I’d wear this top out over some tailored skinny black trousers or jeans instead to balance the volume in the top. A trench coat is always a trans-seasonal winner in my book and it’s hard to go past this very well priced version from Target. A statement bangle and a great pair of pumps complete this relaxed but sharp work outfit. Even though they are great separates for work, all of these pieces can also be worn with casual basics – tuck a white or black tee or tank into the culottes, wear the top with jeans and flats, add the bangle to your favourite denim dress – too. This next outfit is a new take on a perennial Autumn favourite of mine – the long sleeved boho maxi and tan boots. ABOVE, CLOCKWISE FROM TOP LEFT: Iris Earrings, $29.95 from Birdsnest; Golden Temple Midi Dress, $89.95 from Birdsnest; Sunnies, $49.95 from Seed Heritage; Sienna Denim Jacket, $139.95 from Decjuba; Scout boots, $199 from Witchery. There are lots of different options in the boho maxi department at the moment – you’ll find loads more options in this post – but here I’ve opted for this well priced version from Birdsnest. The pom poms add a playful touch while the floaty draping of this dress makes for comfortable wearing, either with your favourite espadrille wedges or tan boots as the weather cools. 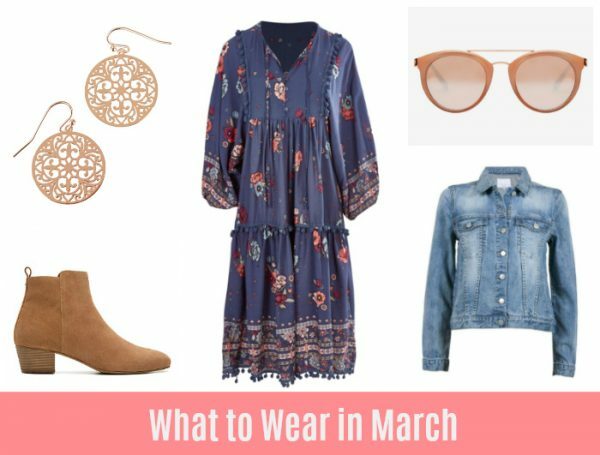 Throw on your denim jacket, a neutral pair of shades for something different and some fine filagree style earrings and you’ve got an outfit that will take you from family birthdays, lunch with the girls through to a night at the movies or parent nights at school. This final outfit incorporates one of my favourite looks right now – the statement jacket over a cami. How fab is this well priced take on the designer boucle jacket? ABOVE, CLOCKWISE FROM TOP LEFT: Double Layered Cami, $19 from Target; Trophy Jacket, $129.99 from Forever New; Earrings, $24.99 from Forever New; Luxe High Rise Skinny Jeans, $99.95 from Decjuba; Alana Heels, $219.95 from Frankie4 Footwear. While this jacket could easily be paired with your favourite monochrome basics for work – over a black shift dress for example – I’ve dressed it down here with a pair of jeans and heels for the weekend. An inexpensive cami and statement earrings add to the overall effect, with a fab pair of heels. I’d wear this outfit for date night, a party or dinner out with the girls. This double layered cami from Target also comes in loads of colours and a great range of sizes if you’re looking for an affordable way to add colour to your Autumn wardrobe too. Which outfit most appeals to you? What do you love about Autumn dressing?